Chintz, for the win. From Diamond Baratta. We have felt the slightest warmth in the air this week and though I'm definitely a fall and winter gal, I am getting pretty psyched to see some flowers again. 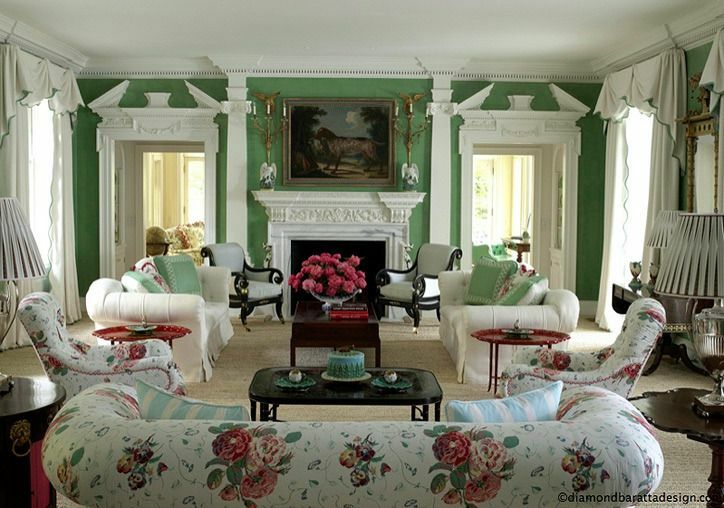 In the meantime, I've been drawn to anything floral recently and I love the upholstery in this room. But what really makes it is that wall color. Beautiful against the millwork! Is that a natural fiber carpet again? I've seen that so much recently in really traditional rooms...and I love it. A breath of Springtime! Have a wonderful weekend Daniella! Great room! The color does it.